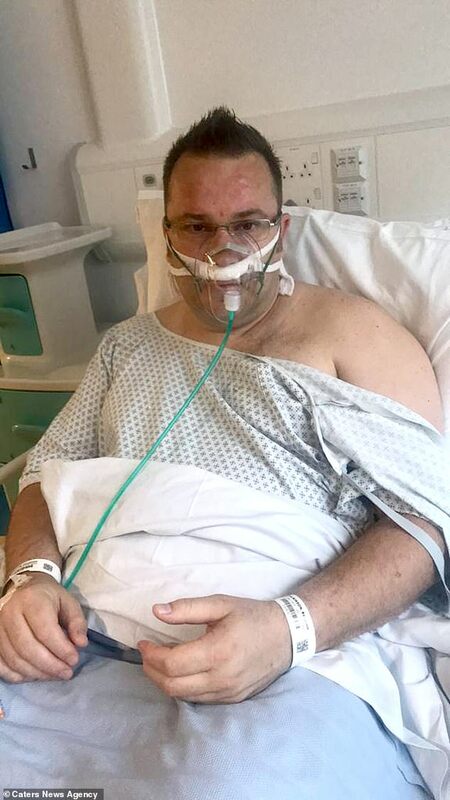 A father-of-three who dismissed his hearing problems as a cold for more than two years was eventually diagnosed with a rare nose cancer that is 'invading his skull'. Ben Wilkinson, 42, from Longlevens, Gloucester, lost his hearing in his right ear in 2016, which he put down to his frequent colds. 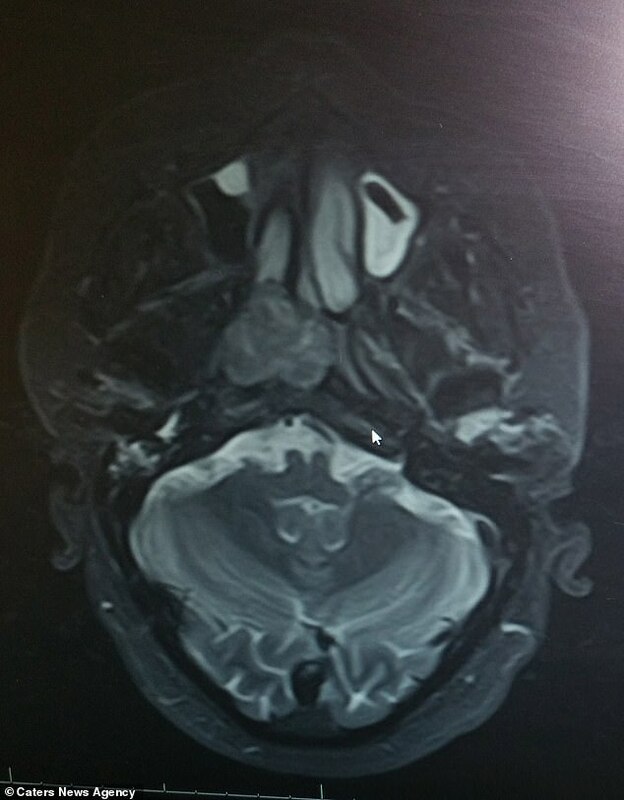 It was not until his GP recommended an MRI scan following a routine hearing test in September last year that doctors discovered the shift manager had a 4cm tumour behind his nose at the base of his skull. Mr Wilkinson was diagnosed with adenocarcinoma and underwent a gruelling two-and-a-half hour operation in May to remove the tumour. But due to the mass being situated close to critical nerves, only part of it could be taken out. Mr Wilkinson has been told he could have radiotherapy to reduce the growth, however, this can damage healthy surrounding tissue, leaving patients unable to swallow, see or hear. 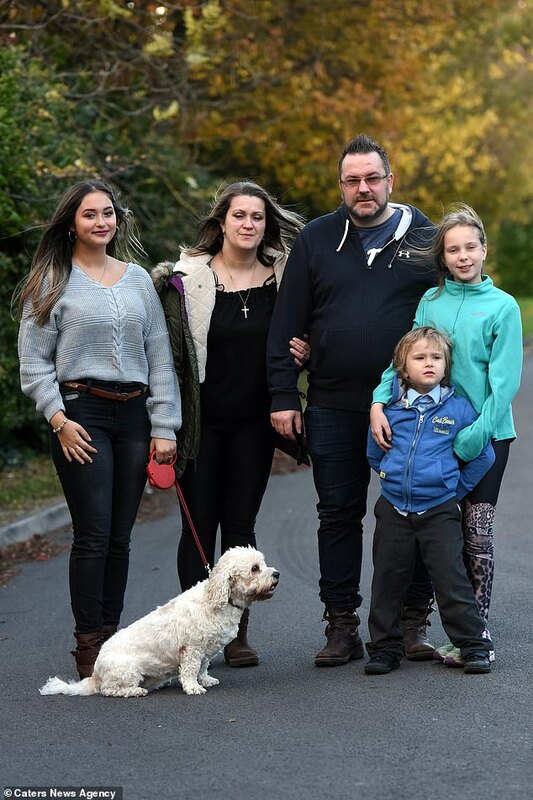 The NHS has turned down his application for more precise proton beam therapy, despite doctors saying there is a 50 per cent chance his cancer will return without it. Speaking of his initial symptoms, Mr Wilkinson said: 'I always had problems with my hearing. Every time I got a cold, my right ear got affected but I never thought anything of it. 'I had been to the doctors but as I always had a cold it was dismissed as mucus from the cold. Mr Wilkinson then underwent an MRI scan that revealed his tumour. 'I was devastated when doctors told me it was a very rare type of cancer, so rare there was barely even a name for it,' he said. 'To make it worse, it was my daughter's 16th birthday the same day. 'We only told our kids a week ago. I said to my wife that we need to tell them, I didn't want them to find out any other way. Despite putting on a brave face, radiotherapy to treat the cancer could leave Mr Wilkinson deaf, while leaving it may be fatal. 'The cancer is invading my skull, and the tumour is very close to critical nerves linked to the communication system,' he said. n May this year, Mr Wilkinson went under the knife with surgeons going through his right nostril in an attempt to remove the mass. However, they discovered it was situated close to critical nerves linked to the brain's communication system and the right carotid artery, which carries blood to the head and neck. 'After my operation, the surgeon told me what I had was called "adenocarcinoma" and he had only seen three similar cases in 20 years,' Mr Wilkinson said. Unable to remove the tumour, the medics discussed Mr Wilkinson's other options, with one being proton beam therapy. After doing his own research, Mr Wilkinson discovered this treatment is specifically intended to remove tumours in sensitive areas, such as the head or spine, without damaging any healthy tissues, unlike radiotherapy. In August, Mr Wilkinson applied to the NHS proton therapy panel for funding after his oncologist told him he met all the requirements for the treatment. But he claims the NHS declined his application on the October 17 and have since refused to tell him why despite his many calls and emails. 'The only reason that I could see from my rejection letter was that they said it looked like maximal resection had not been achieved, which was one of the listed criteria,' Mr Wilkinson said. Mr Wilkinson and his wife Bozena, 43, are now fundraising to go to Prague to have proton beam therapy at a cost of £66,500 for 38 cycles over eight-to-ten weeks. They have raised more than £8,000 of their £70,000 target to date. Without this treatment, Mr Wilkinson will be forced to undergo standard radiotherapy, which can affect the facial muscles, speech and eyesight. 'I am just failing to understand why I am not a good fit for proton beam therapy,' he said. An NHS England spokesperson said: 'The NHS does fund proton beam therapy in this country and internationally where top doctors say it is advantageous, but it is not always clinically appropriate or a better treatment than other options already available on the NHS.